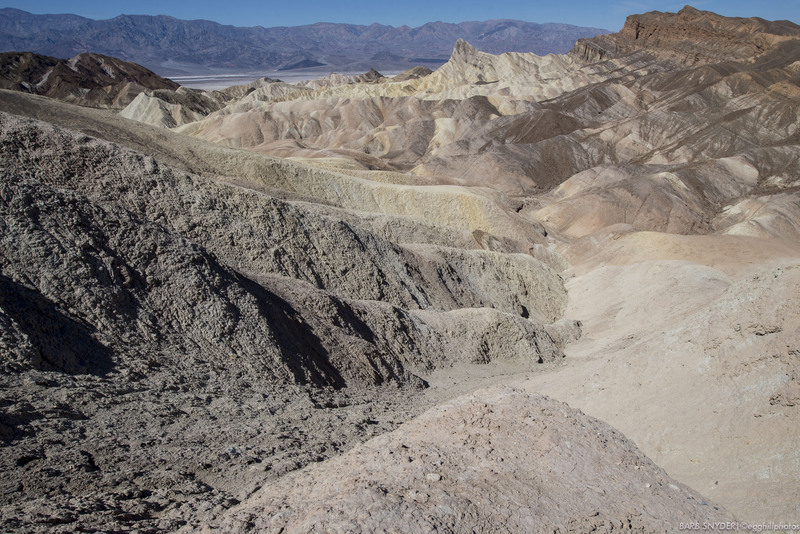 If you’ve followed my recent posts, you know that this is my third trip to Death Valley in just over a month and the second trip was snow, so it hardly counts since we didn’t actually cross the two mountain ranges to get into the valley. The park is close enough that visits in late fall, winter and spring are easy to arrange, since summer is a time to avoid (to my thinking) – it’s like the old East Coast farmer’s adage – make hay while the sun shines. I have a hard time wrapping my mind around this national park being 5,219 square miles, but 3.4 million acres is hard to imagine too – unless you start driving in the park. Traveling with photography buddies allowed me to watch the scenery instead of the road which is a nice switch. 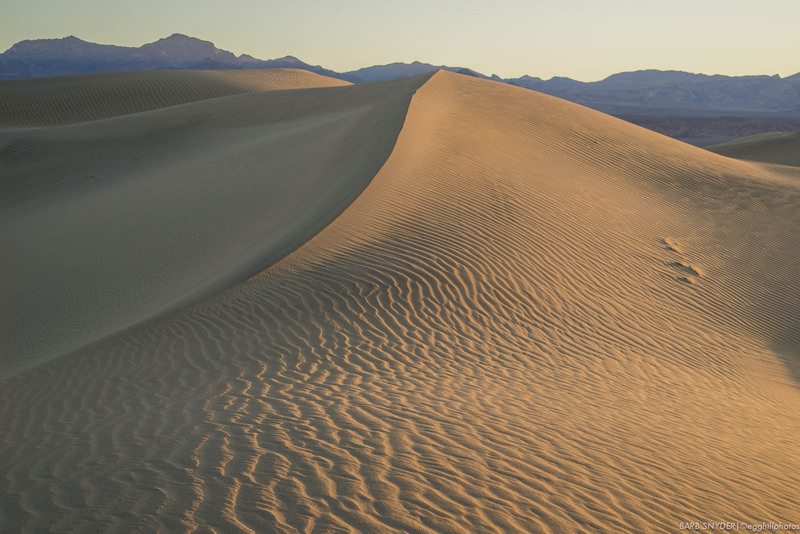 To catch the light on the dunes, you must be there before dawn to catch the sun’s first rays. That means leaving home at 4:00 am. 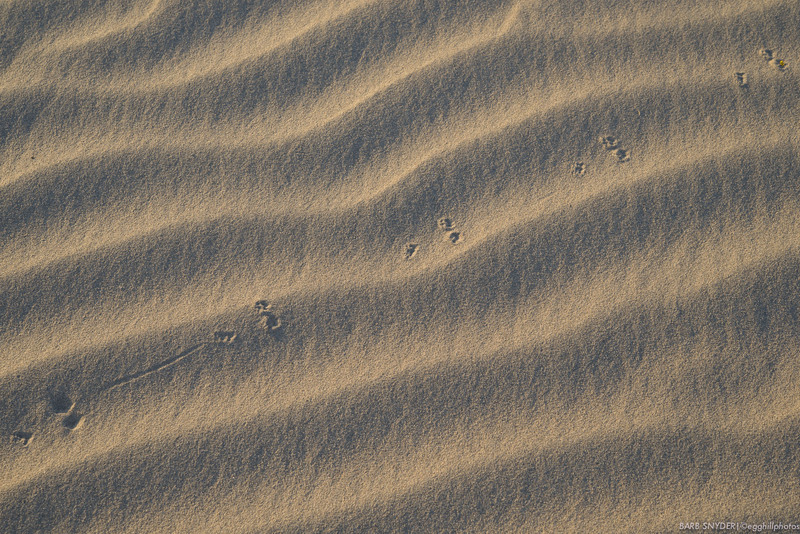 Otherwise, the sand is completely flat looking. 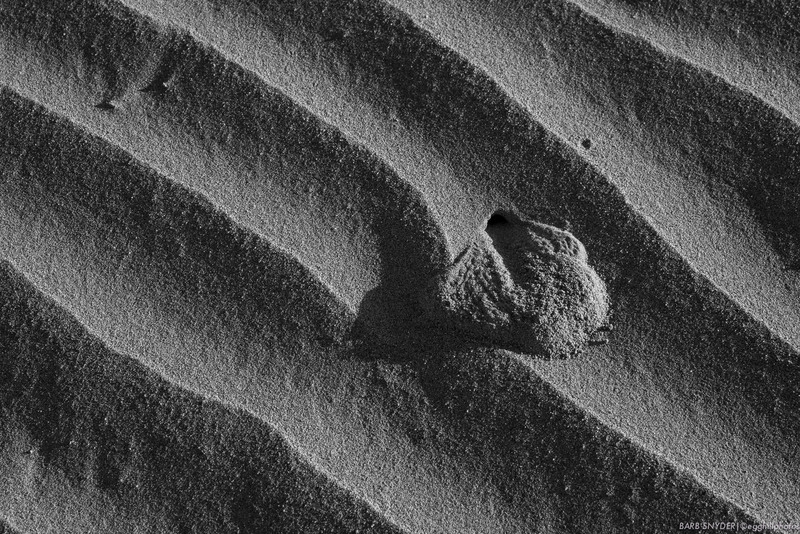 I decided to use a 60mm micro lens today and catch some of the small stuff on the dunes. 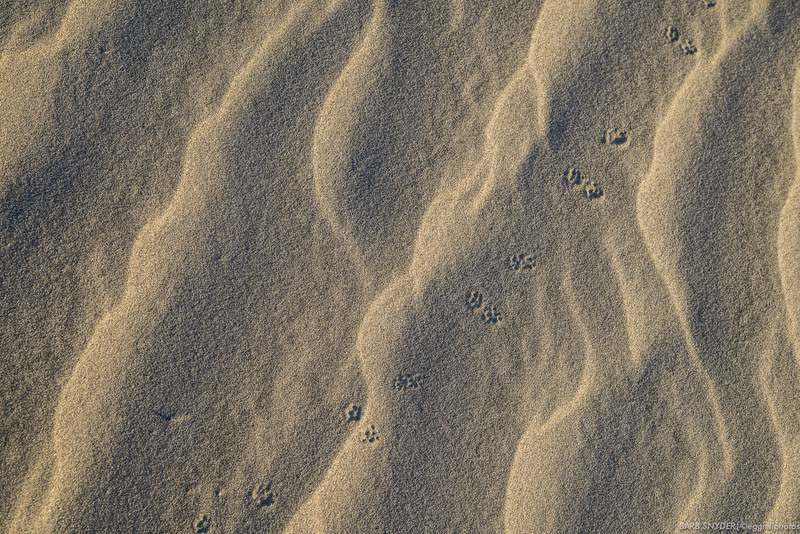 I think these are tracks of a Desert Pocket Mouse and he dragged his tail for one of his steps although I’m not certain that’s what it is. Is this the same animal? 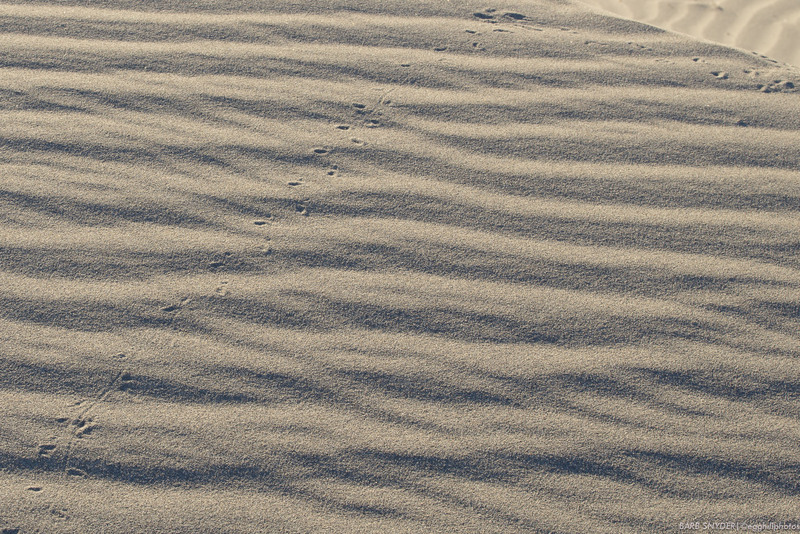 He’s going in a different direction on a different dune. This may have been a lizard. A black and white photo of a flying insect’s home (I saw him fly out but don’t know what he was.) Thankfully, no snake sightings. After breakfast in the Forty-Niner Cafe at Furnace Creek Ranch, we visited the more expensive restaurant on the hill: “The Inn at Furnace Creek“. 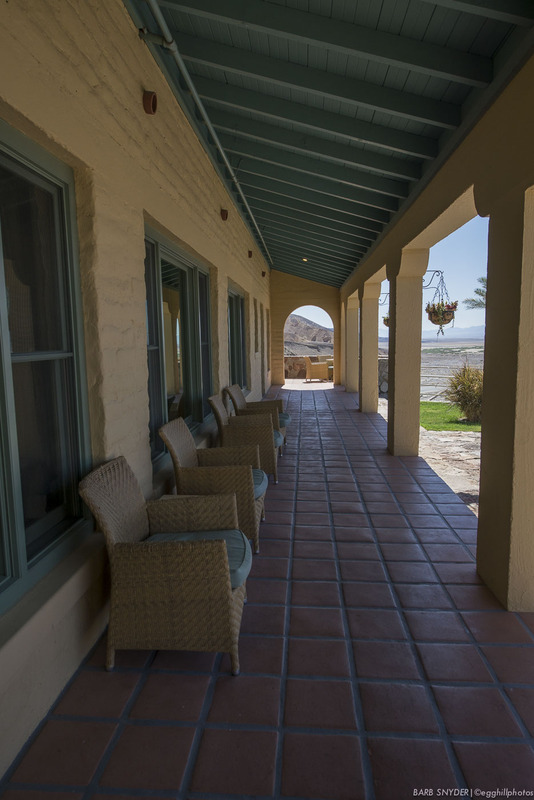 There are palm trees and water at both locations, but the historic Inn was built first in 1927 by the Pacific Coast Borax Company to bring tourists into Death Valley to save the railroad they’d built for the borax mine. The woodwork inside reminded me of many DuPont mansions on the East Coast, in particular, the Pierce-DuPont House in Longwood Gardens. 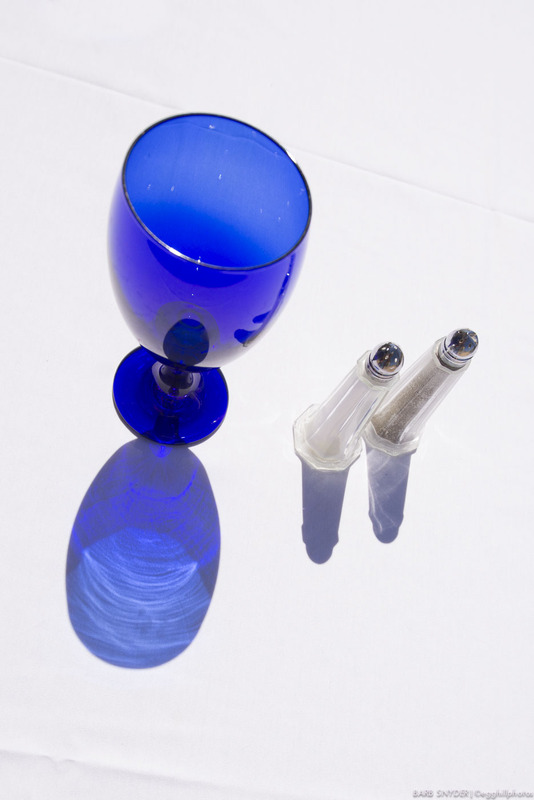 Several tables were set outside, but there were few takers as the temperatures were nearing 90°. 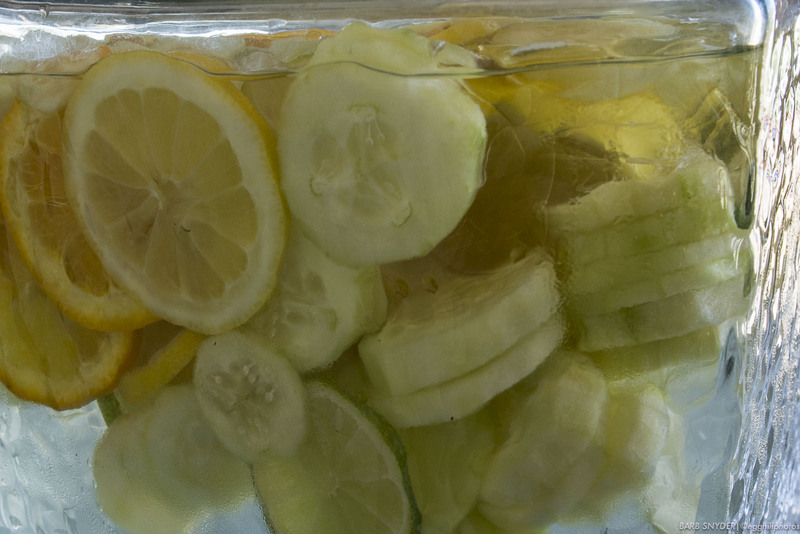 Inside the inn, you could partake of cool cucumber-citris water. 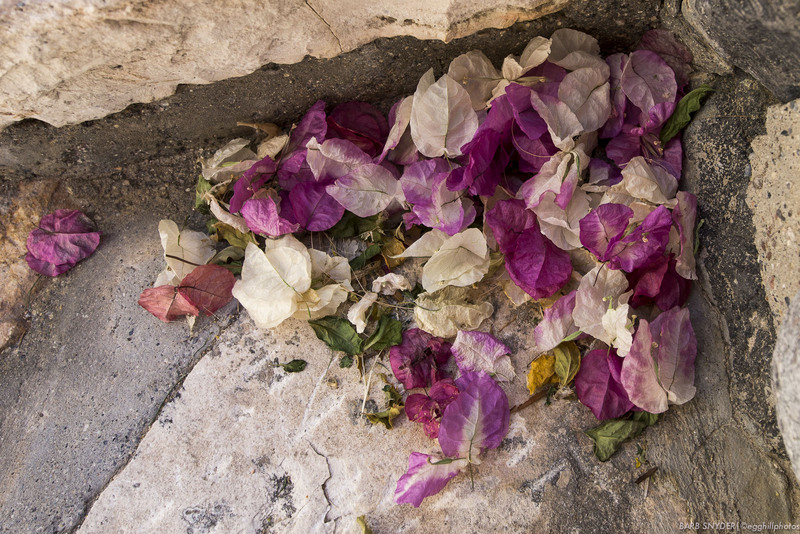 The bougainvillea blooms were beautiful, whites, fuchsia, and fuschsia/white combination. These spent blooms weren’t spent enough for me to ignore. You can try clicking your mouse to enlarge the photo, they’re so delicate in close-ups. 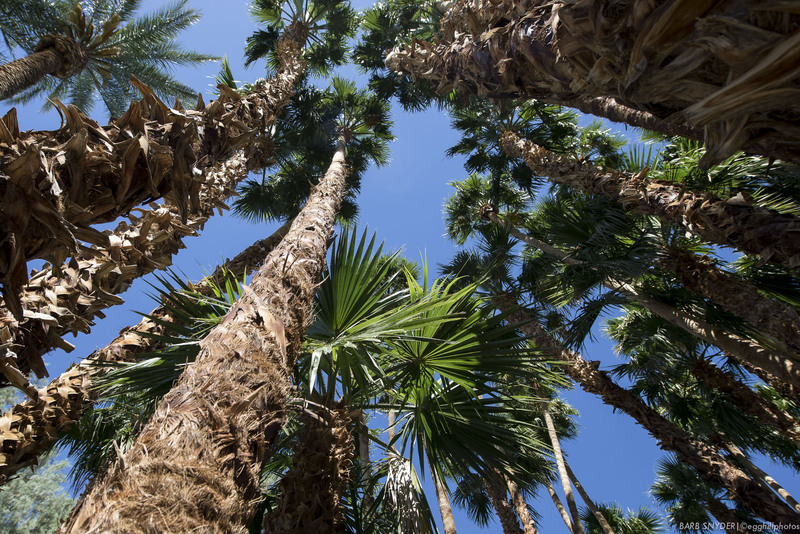 The towering palms shaded a pool that will have water lilies blooming later in the summer. We rode through Artist’s Palette where the colors are wonderful: butterscotch, bananas and chocolate syrup – there will be more photos from there Day 2. 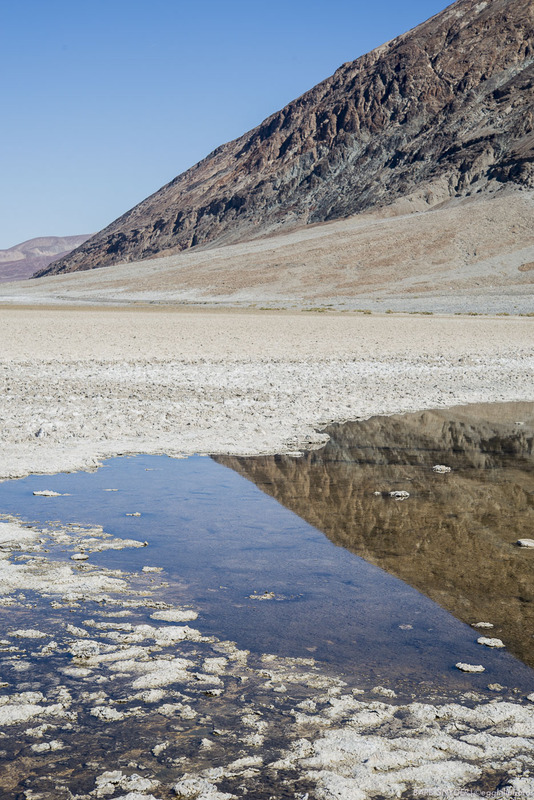 A trip to Death Valley isn’t usually complete without a trip to Badwater at 287′ below sea level (remember, the valley was once part of a sea). When I first drove through Death Valley in 2011, the salt flats all had hexagonal shapes of dried salt (check the picture on the link to Death Valley National Park). This visit however, was disappointing. It looked like a John Deere tractor (without the tire prints) pulling a huge disc had gone over the entire area. Apparently, torrential rains and subsequent floods had ruined the hexagonal shapes in the salt flats. A visit to Rhyolite (part of the National Park Service in Nevada) finished our first day. 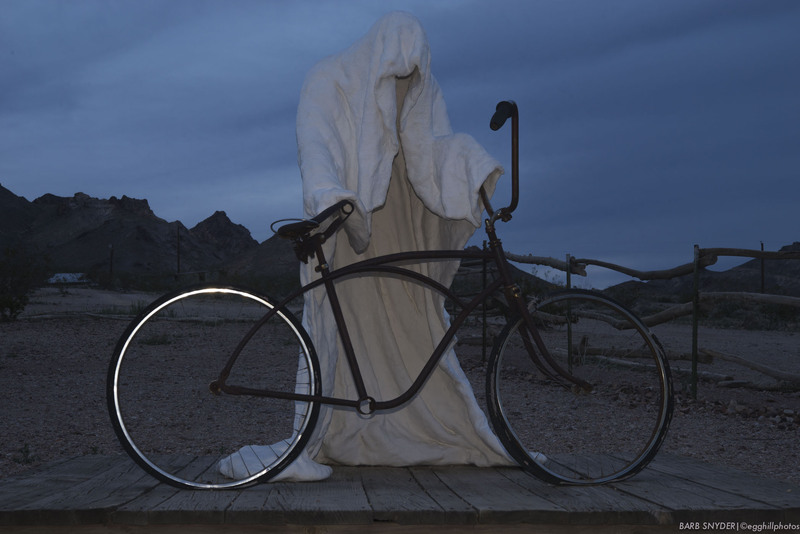 Rhyolite was a gold mining town that went bust as so many mining towns did. An artist named Szukalski lived in what is now a museum and sculpted some interesting things, a 20′ lego man, a concrete mosaic sofa, a lady on a stake wearing a chastity belt. 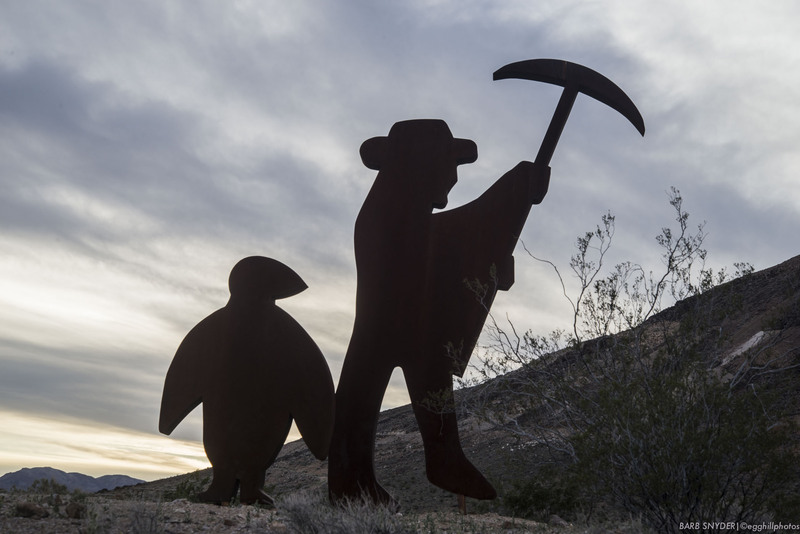 The miner and what I think looks like a penquin is perpetually striking the mountain. 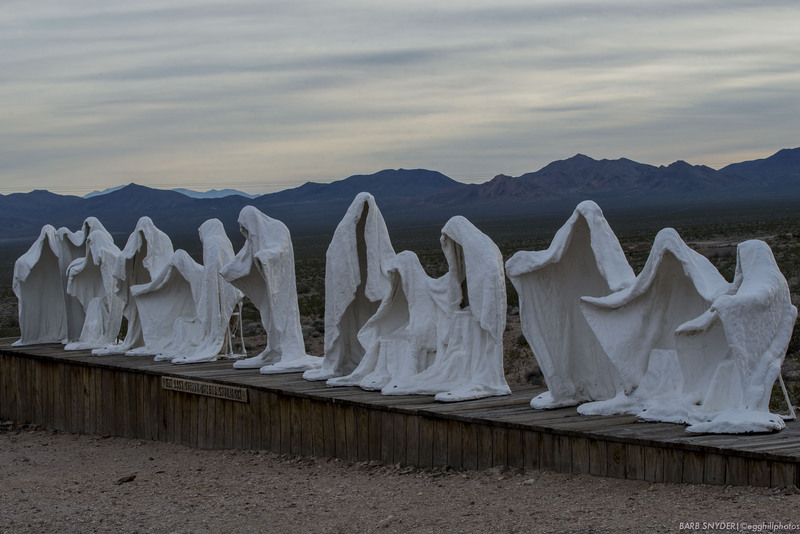 The Last Supper of ghosts watches over a labyrinth of rock. This is a ghost after my own heart! Always love your pictures, Barb! I’m still into online puzzles (jigsawplanet.com) so I am always happy to have some interesting photos to make into puzzles (for my own use). I keep thinking I’m going to do that for myself and gifts, actually found one of those roll-up kits to put away temporarily. I’ll have to try them. Interesting photos, Barb. 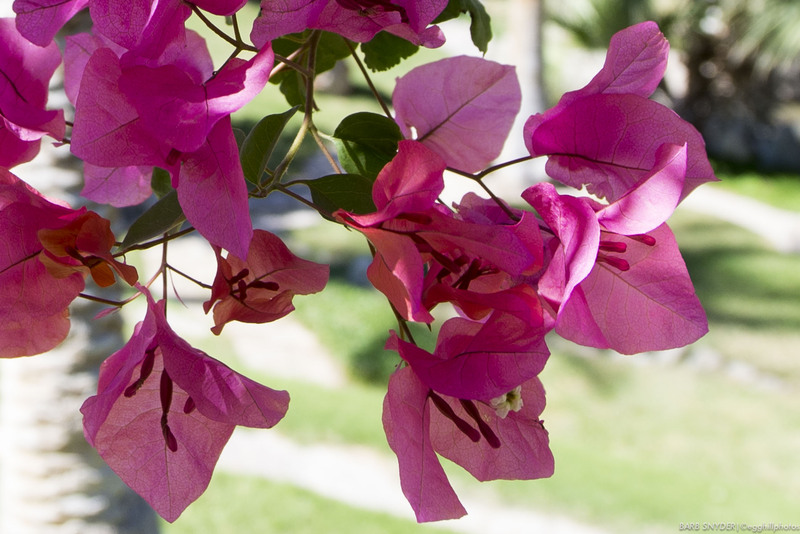 I too love bougainvilleas and ripples on sand dunes. How many pics do I need of ripples? Can’t stop. ‘Need’ isn’t a word you need to use. You take as many as you want. I have a compulsion for sunsets and flowers. And many other things! You know what that’s like. We stayed in Beatty, it was just one overnight, as I came back for choir on Sunday. On the way out, I noticed several other places I’ll have to explore.